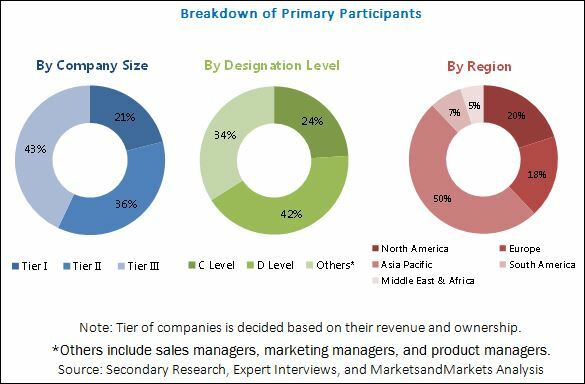 [169 Pages Report] on Seamless Pipes Market was estimated to be USD 183.79 Billion in 2017 and is projected to reach USD 237.11 Billion by 2022, at a CAGR of 5.2% during the forecast period from 2017 to 2022. To estimate, analyze, and forecast the seamless pipes market with respect regions, including North America, Europe, Asia-Pacific, South America, and Middle East & Africa and key countries in the region. The research methodology used to estimate and forecast the seamless pipes market began with capturing data on key vendor revenues through secondary sources, such as Hoovers, Bloomberg, Chemical Weekly, Factiva, and various other government and private websites and databases. The vendor offerings were taken into consideration to determine the market segmentation. After arriving at the overall market size, the total market was split into several segments and sub-segments, which were later verified through primary research by conducting extensive interviews with key personnel, such as CEOs, VPs, directors, and executives. Data triangulation and market breakdown procedures were employed to complete the overall market engineering process and arrive at the exact statistics for all segments and sub-segments of the market. The breakdown of profiles of primaries is depicted in the figure below. 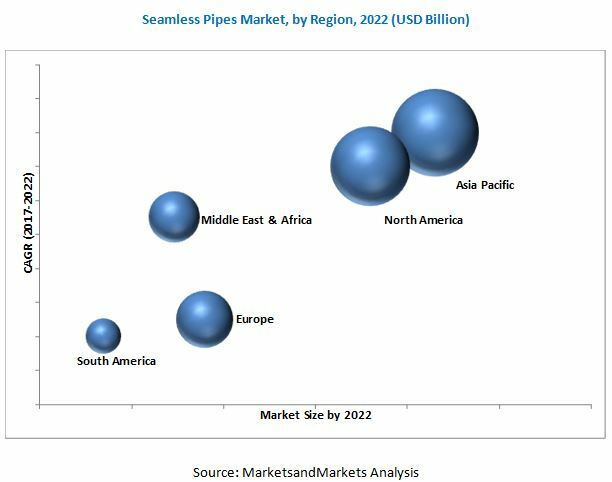 The seamless pipes market has a diversified ecosystem, which includes seamless pipe manufacturers, raw material suppliers, along with project contractors and service providers, vendors, end users, and government organizations. Companies operating in the global seamless pipes market include Zaffertec S.L. (Spain), Cimco Europe C.F. (Italy), Wheatland Tube Company (U.S.), Techint Group SpA (Italy), ISMT Ltd. (India), ALCO SAS (Colombia), Shalco Industries Pvt. Ltd. (India), UMW Group (Malaysia), United Seamless Tubular Pvt. Ltd. (India), Nippon Steel & Sumitomo Metal Corporation (Japan), ArcelorMittal SA (Luxembourg), JFE Steel Corporation (Japan), Tenaris S.A. (Luxembourg), Vallourec AG (France), IPP Europe Ltd. (U.K.), Jindal Saw Ltd. (India), Tianjin Pipe (Group) Corporation (China), PAO TMK (Russia), Sandvik AB (Sweden), United States Steel Corporation (U.S.), Schulz USA (U.S.), ChelPipe (Russia), EVRAZ Plc (U.K.), Salzgitter Mannesmann Stainless Tubes GmbH (Germany), and Tubos Reunidos, S.A. (Spain). Scope of the report: This research report categorizes the seamless pipes market based on type, materials, production process, end-use industry, and region, forecasting revenues as well as analyzing trends in each of the submarkets. The seamless pipes market is estimated to be USD 183.79 Billion in 2017 and is projected to reach USD 237.11 Billion by 2022, at a CAGR of 5.2% during the forecast period from 2017 to 2022. The increasing demand for seamless pipes from emerging countries and increasing investments in the infrastructure & construction end-use industry are the key factors expected to drive the growth of the market in the coming years. Hot finish seamless pipes are majorly manufactured through processes, such as extrusion, rotary piercing, and other hot working processes. The cost of hot finish seamless pipes is lesser than cold finished seamless pipes and thus the pipes are preferred in different end-use applications. Based on type, the hot finish seamless pipes segment is estimated to be a larger segment of the market in 2017. The segment is expected to grow from USD 98.80 billion in 2017 to USD 130.20 billion by 2022, at a CAGR of 5.7% during the forecast period. Seamless pipes are manufactured using varied materials, such as steel & alloys, copper & alloys, and nickel & alloys, among others. Based on material, the steel & alloys segment is estimated to be the largest segment of the seamless pipes market in 2017. Steel is one of the key materials preferred for the manufacturing of seamless pipes, owing to its high strength and durability of seamless steel pipes. Seamless pipes can be manufactured using three processes, namely, continuous mandrel rolling, multi-stand plug mill, and cross-roll piercing & pilger rolling. The cross-roll piercing & pilger rolling segment of the seamless pipes market is estimated to be the largest segment of the market in 2017. The cross-roll piercing & pilger rolling method is highly cost-efficient, which helps reduce the overall manufacturing cost of the end products. The oil & gas segment is estimated to be the largest end-use industry of the seamless pipes market in 2017. Seamless steel pipes are preferred in oil and gas projects, due to their durability, strength, and corrosion resistance. Seamless pipes are majorly used in offshore rigs and oil field drilling activities. A large number of pipeline projects are expected to be commissioned across the globe in the next five years, which is expected to drive the demand for seamless pipes in the coming years. These pipes are also used in the infrastructure & construction end-use industry mainly for water supply, sewage transport, and so on. The infrastructure & construction segment is expected grow at the highest CAGR of 5.9% during the forecast period of 2017 to 2022. The Asia Pacific region is estimated to be the largest market for seamless pipes in 2017. China and Japan are the major countries in the seamless pipes market in the region. The growth of the Asia Pacific market can be attributed to the increasing investments in the infrastructure & construction end-use industry. Volatility in raw material prices can restrain the growth of the seamless pipes market. Key players operating in the market include Zaffertec S.L. (Spain), Cimco Europe C.F. (Italy), Wheatland Tube Company (US), Techint Group SpA (Italy), ISMT Ltd. (India), ALCO SAS (Colombia), Shalco Industries Pvt. Ltd. (India), UMW Group (Malaysia), United Seamless Tubular Pvt. Ltd. (India), Nippon Steel & Sumitomo Metal Corporation (Japan), ArcelorMittal SA (Luxembourg), JFE Steel Corporation (Japan), Tenaris S.A. (Luxembourg), Vallourec AG (France), IPP Europe Ltd. (UK), Jindal Saw Ltd. (India), Tianjin Pipe (Group) Corporation (China), PAO TMK (Russia), Sandvik AB (Sweden), United States Steel Corporation (US), Schulz USA (US), ChelPipe (Russia), EVRAZ Plc (UK), Salzgitter Mannesmann Stainless Tubes GmbH (Germany), and Tubos Reunidos, S.A. (Spain). Key companies in the market adopted strategies, such as expansions and agreements to meet the growing demand for seamless pipes and increase their market shares. 12.11 Indian Seamless Metal Tubes Limited. 12.13.5 United Seamless Tubulaar Pvt. Ltd.
12.13.6 Shalco Industries Pvt. Ltd.